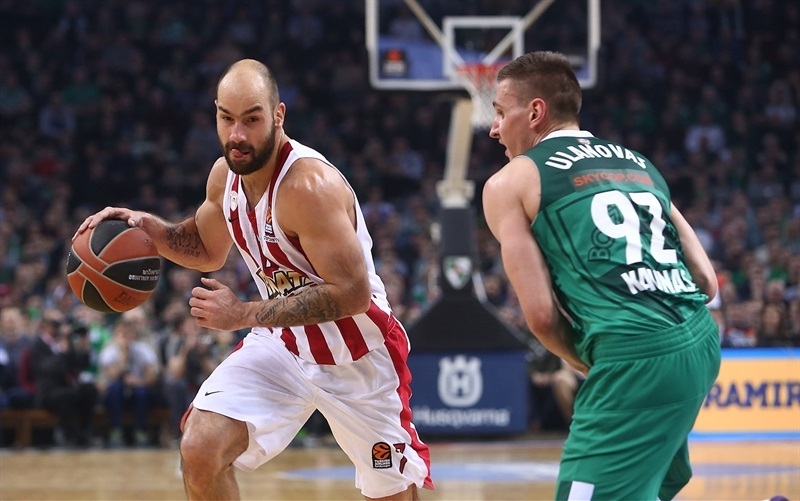 Zalgiris Kaunas made a statement on Thursday night by edging visiting Olympiacos Piraeus 74-68 for its fifth consecutive win. Zalgiris improved to 10-5 on the season for to secure at least fourth place in the standings at the midway point in the regular season. 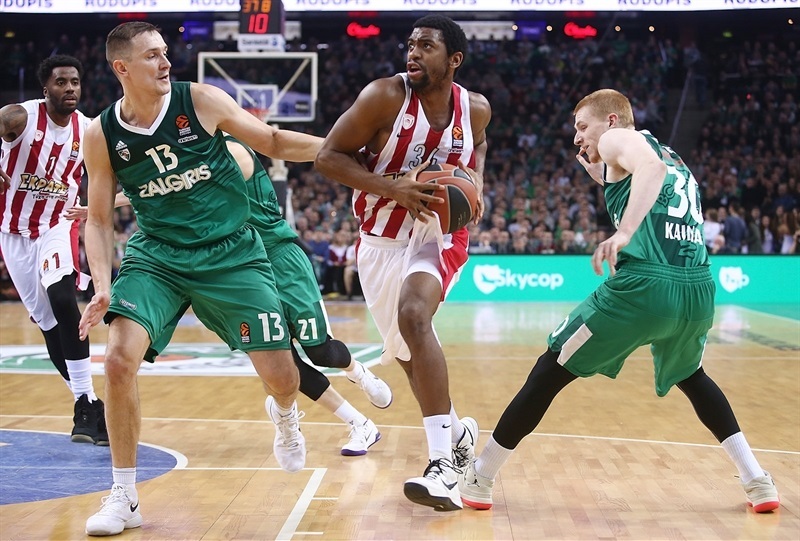 Olympiacos dropped to 11-4. 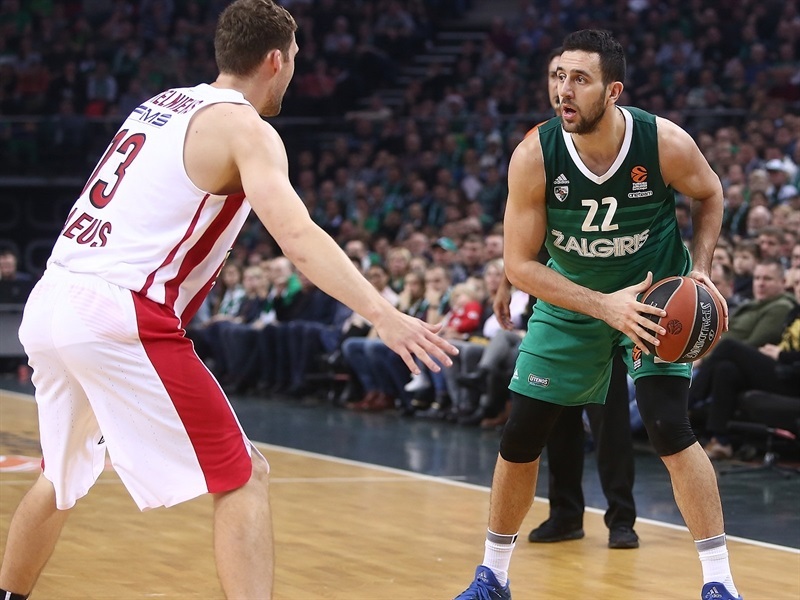 In a hard-fought game, neither team held a lead bigger than 7 points the entire night, and such a 7-point margin belonged to Zalgiris in the fourth quarter after an 11-2 run that put the hosts up for good. 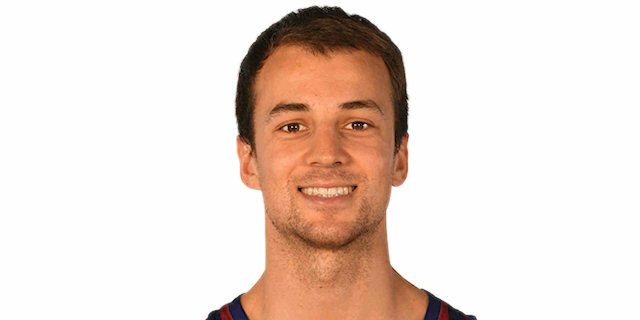 Kevin Pangos, who was clutch in the final minutes, finished with 14 points and 7 assists. Arturas Milaknis also netted 14 points, Paulius Jankunas scored 12, and Vasilije Micic added 11 in victory. 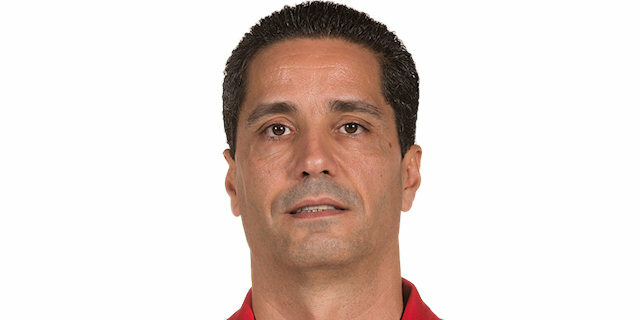 Ioannis Papapetrou led the visitors in scoring with 12 points. 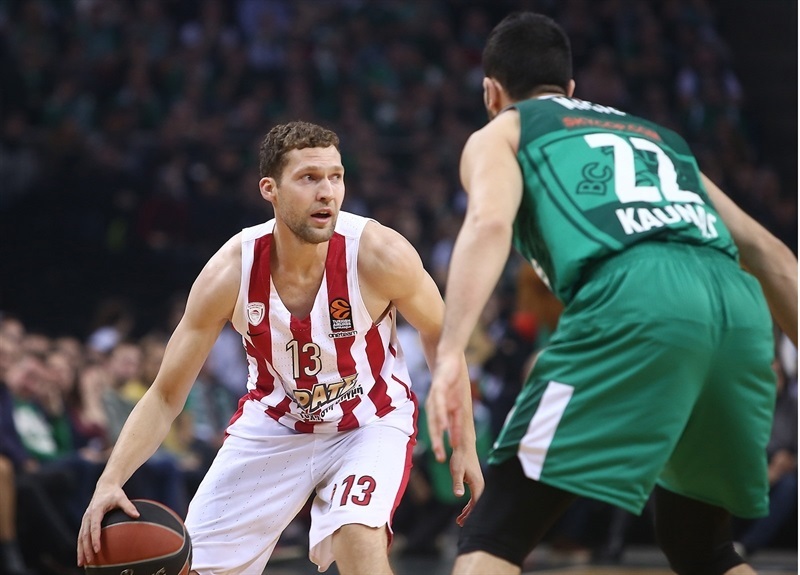 Kostas Papanikolaou had 11 points, Hollis Thompson collected 10 points and 8 rebounds, while Vassilis Spanoulis tallied 10 points and 7 assists for Olympiacos, which was without Georgios Printezis, Nikola Milutinov and Vangelis Mantzaris. 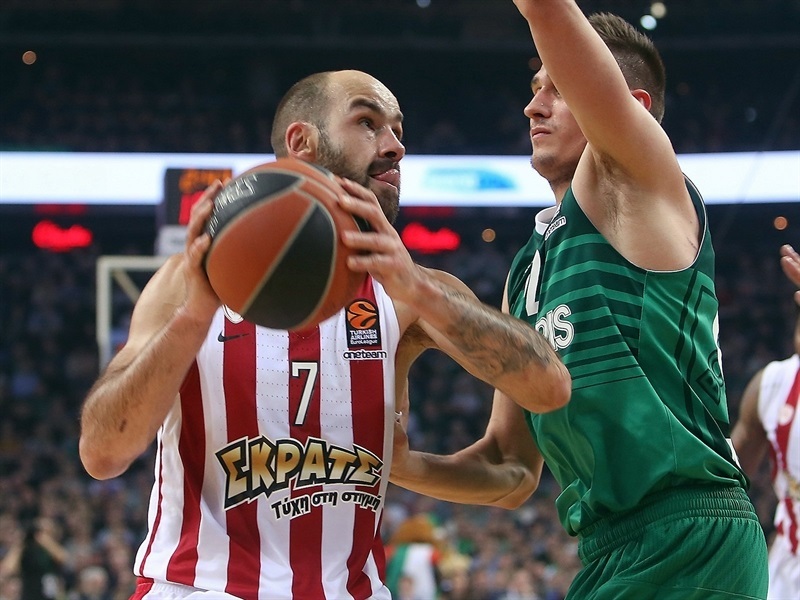 Olympiacos converted on five of its first six possessions, with Spanoulis dishing nifty passes to Georgios Bogris and Papappetrou inside before Brian Roberts and Spanoulis hit from outside to make it 7-12. But Milaknis nailed a pair of three-pointers and Micic, Jankunas and Antanas Kavaliauskas took it to the hoop, helping the hosts take a 22-19 advantage after 10 minutes. 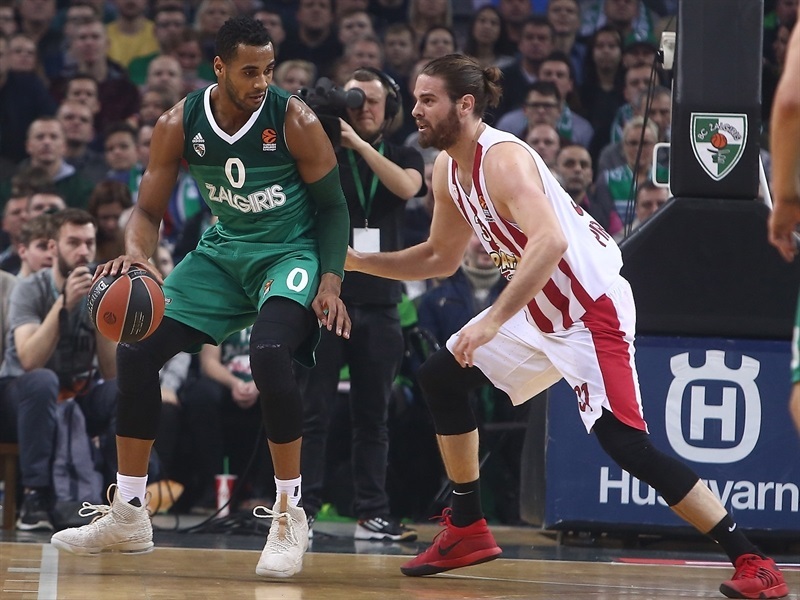 Pangos hit a three-pointer to open the second quarter, but a three-point play from Jamel McLean and a triple from Janis Strelnieks in a 0-8 run put Olympiacos in front 25-27. The teams traded buckets until Thompson’s triple gave the visitors a 31-35 advantage. Kavaliauskas and Pangos found their way to score inside, but the Reds kept the lead and want into halftime up 36-38. 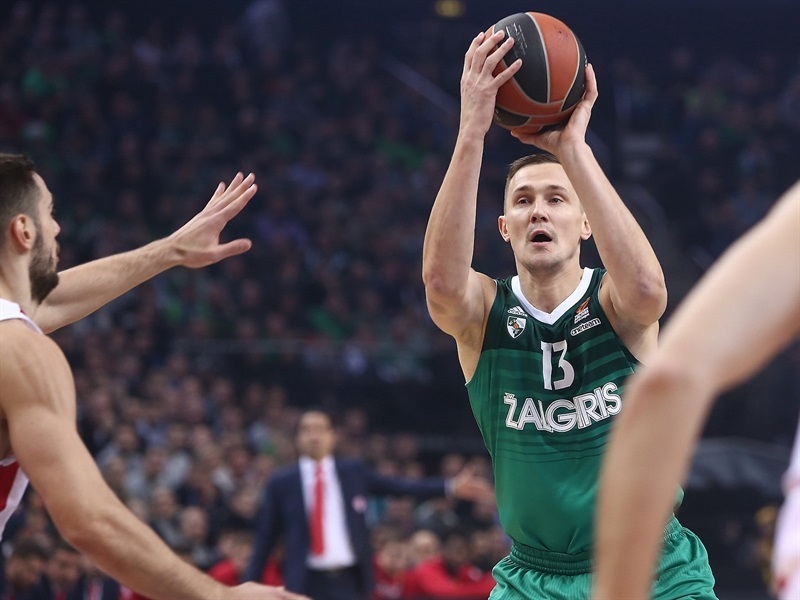 Jankunas opened the second half with a pair of jumpers, and after Milaknis and Papanikolaou traded three-pointers, Milaknis hit another one, his fourth, to put Zalgiris in front 48-44. 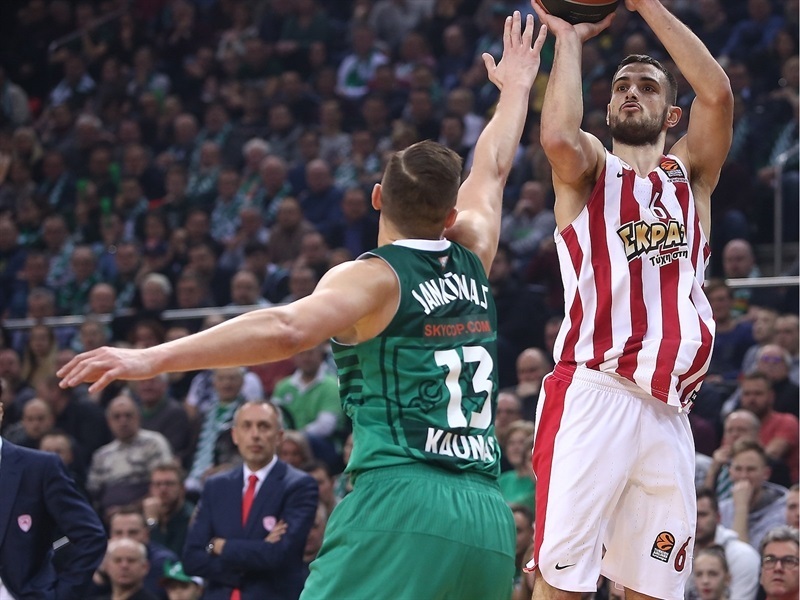 However, it was Olympiacos’s turn to make a run, as Papapetrou answered with a second-chance three and Papanikolaou added his second shot from downtown in a short span, making it 48-53 at the end of third quarter. 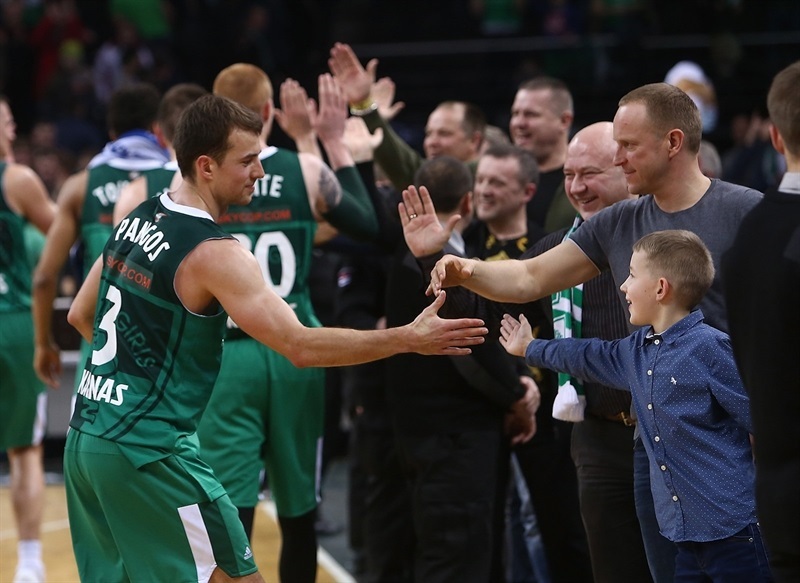 In the fourth, it was Jankunas sinking back-to-back jumpers from the identical spot on the right baseline, and Edgaras Ulanovas had a dunk to put Zalgiris back in front 54-53. 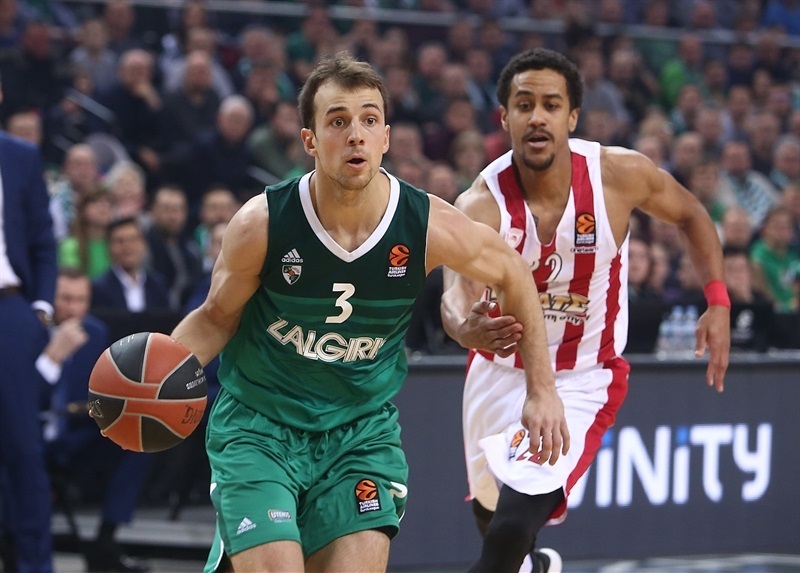 Spanoulis and Pangos traded three-pointers, and after a long jumper by Papapetrou, Ulanovas and Pangos each nailed a three-pointer to make it 65-58 midway through the fourth for the biggest lead of the night. Strelnieks answered with a jumper-plus-foul, and after Micic and Thompson traded triples, Papapetrou’s layup with 66 seconds to go cut the margin to 69-66. 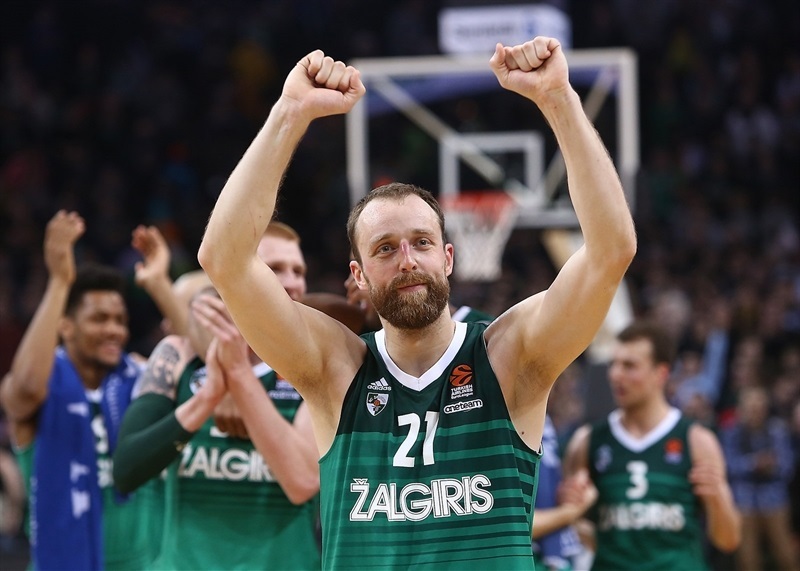 On the ensuing possession, Pangos connected with Aaron White for an alley-oop dunk, and after Spanoulis made 2 free throws, White’s put-back dunk with 14 seconds remaining sealed the outcome and sent the Zalgiris crowd into a frenzy. "It’s an unbelievable feeling for us. The most important is that players are showing character. Sometimes we are not playing the smartest basketball, but I think we are all going in the same direction. And on one team that is important, that players understand there are bigger goals and they are willing to sacrifice, so all the credit to them. We knew it was not going to be possible to beat Olympiacos in an offensive game, we had to suffer, suffer, and somewhere attack. We hit some key three-point shots, and luckily the game turned our way." "It was important to stay close and to try to make a run at some point at the end. And more or less, that’s what happened. It was exactly the game we thought it would be. We did not expect a lot of scoring, a lot of nice basketball, but in this situation, it is most important to win." "We had a very difficult mission because we had a lot of absences that changed our lineup a lot. But I think the 11 players that were here did a great job tonight, playing against a good team on its home court. We controlled the game from our defense most of the game. In the last quarter we had some open shots that could have opened a lead for us when we were up by 5. 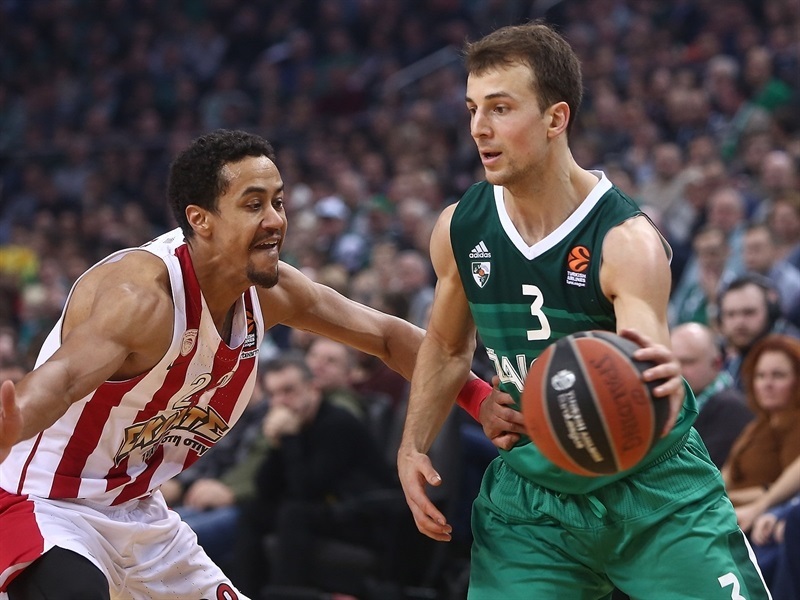 But missed shots and bad decisions gave Zalgiris a chance to score easy points. We did not give up, we fought until the end, but I think that some hesitation on offense, on one side did not let us score on offense, and on the other, made us not be so aggressive on defense. That’s the reason Zalgiris scored 26 points in the fourth quarter. They scored as much in the second and third quarters combined. I have no complaints to my players, we need to continue and move one. 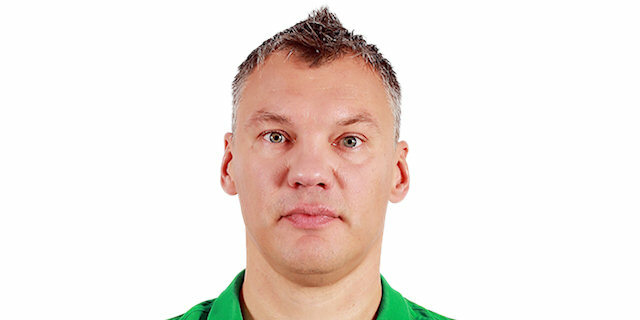 Congratulations to Zalgiris on victory. That is a solid team, with a good chemistry. They know what they want to do on the court. They are well organized on the court basketball-wise. Everyone has his role, they play for the team, and these are the best ingredients to have success." " It feels amazing. It always feels good to beat great teams like that. We are not playing perfect at all, but we are just playing hard, and it’s working of us. I think we just defended better. We messed up a bit in the first half, made some mistakes, in the second half we rebounded and got some stops. We were more disciplined."